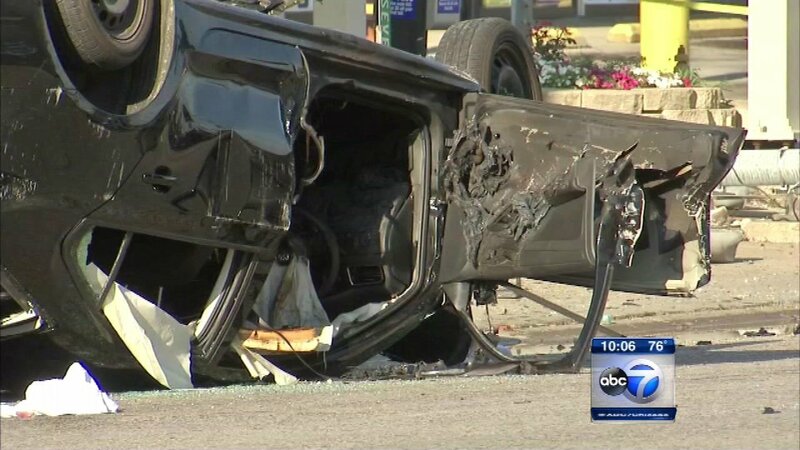 MAYWOOD, Ill. (WLS) -- One person was killed and another injured after a fiery rollover crash in west suburban Maywood. Fire Chief Craig Bronaugh said a man on the street was killed after being struck by a vehicle at 9th Avenue and Roosevelt around 3:30 p.m. The driver of the vehicle, a woman whose exact age was unknown, was believed to be driving west on Roosevelt Road at the time of the crash, Bronaugh said. Firefighters were able to extinguish the fire and extricate the woman, who was taken to Loyola University Medical Center with burns to her legs. Her condition was not known. Witnesses at the scene did not see the crash take place and the circumstances are still under investigation. Maywood police are trying to determine if the woman was trying to beat a red light. Witnesses said she was speeding down Roosevelt, perhaps going more than 70 mph. "I go outside and I just see a car flipped over and smoke everywhere," said witness Khalid Alyafai. Witnesses said they believe the man was walking from the VA hospital when he was hit. They said the SUV crashed into a street pole, rolled over several times and crushed him. As a result of the impact, he was dismembered. "I was really freaked out, I'd never really seen anything like that in my life," said Mohamed Seck, a Proviso East student who witnessed the aftermath of the crash when he was walking home from school with his cousin Cori Robinson. "I had food in my hand and I had dropped my food because I was like- It was very disturbing," said Robinson. Police are reviewing surveillance video from the BP station as well as checking to see if any other businesses captured the crash on their security cameras. The speed limit for that section of Roosevelt Road is 30 mph.